Jimmy Cool, attorney for ACRA, responds to the proposed revision to Arizona Supreme Court Rule 30. Click here to view the response. A proposed revision to Arizona Supreme Court Rule 30 has been made that affects court reporters. Click here to view the proposal. Kahryn passed away on Thursday, March 1, 2018. Kahryn started her reporting career with Bartelt, King in the early '80s. In 1985 she opened her own firm of Nix & Associates, which later became Driver & Nix. Recently, she rejoined Bartelt to form Bartelt | Nix. Kahryn was active with ACRA and served as it's President, 1992-1993. Her slogan,"The name to know when you need a court reporter" was truly the epitome of who Kahryn was. She was a wealth of information and loved to network, working with many firms across the country and beyond. Kahryn will be greatly missed by all within the legal and court reporting community. The National Court Reporters Foundation’s newly elected Trustees began their three-year terms on Aug. 12 after being inducted into service at the Foundation’s annual Board of Trustees meeting taking place in conjunction with the 2017 NCRA Convention & Expo in Las Vegas, Nev. The following individuals were elected to serve on the 2017-2018 NCRF Board of Trustees: Danielle Griffin, RPR, Phoenix, Ariz.; Karen G. Teig, RPR, CRR, CMRS, Cedar Rapids, Iowa; and Sandy VanderPol, FAPR, RMR, CRR, Lotus, Calif.
Danielle Griffin represents the future of the profession and can aid NCRF in its continued focus on helping students finish court reporting school and new reporters acquire the opportunities to thrive in the profession. She grew up in the court reporting field, working in her mother’s firm in Phoenix from the time she was in middle school, an experience that gives her more in-depth understanding of the business and profession than the average new reporter. As a new reporter with diverse experience and contacts, Griffin commits fully to everything she does. Griffin comes from a culture of volunteerism and strong fundraising experience and understands the value of networking and using those contacts to help make whatever she’s tasked with successful. RESTON, Va., Aug. 23, 2017 — The National Court Reporters Association (NCRA), the country’s leading organization representing stenographic court reporters, broadcast and CART captioners, and legal videographers, today announced that Doreen Sutton, a freelance reporter from Scottsdale, Ariz., was installed as 2017-2018 Vice President, during the association’s annual Convention & Expo held Aug. 10-13 in Las Vegas, Nev.
Sutton, who holds the nationally recognized professional certification of Registered Professional Reporter (RPR), has been a freelance court reporter for 25 years, specializing in depositions, arbitrations, and mediations. She also has experience in per-diem reporting for Maricopa County Superior Court and in grand jury reporting, and has dabbled in providing CART (communication access realtime translation) services. Prior to becoming a court reporter, Sutton worked in the areas of banking, payroll, and accounting. A member of NCRA since 1992, she has attended a number of the association’s Legislative Boot Camps, State Leadership Conferences, and NCRA-sponsored seminars and conventions. She has also served on NCRA’s Test Advisory Committee and as a member of the association’s Board of Directors. She also served two terms as NCRA Secretary-Treasurer. In 2017, she was made a Fellow of the Academy of Professional Reporters (FAPR). Sutton has been a member of the Arizona Court Reporters Association (ACRA) since 1994 and served as its president in 2007 and as its president-elect in 2006. She also served as editor of ArizoNotes, ACRA’s membership newsletter, and co-chaired the association’s Student Seminars Committee. In 2013, she was honored with ACRA’s Distinguished Service Award. Also installed to serve on NCRA’s Executive Committee were: Christine J. Willette, RDR, CRR, CRC, Wausau, Wis., as President; Sue A. Terry, FAPR, RPR, CRR, Springfield, Ohio, as President-Elect; and Debra Dibble, RDR, CRR, CRC, Woodland, Utah, to a second term as Secretary-Treasurer. Newly elected directors include: Meredith A. Bonn, RPR, Webster, N.Y.; Robyn M. Hennigan, RPR, CRI, Springfield, Ohio; and Tonya J. Kaiser, RPR, CMRS, Fort Wayne, Ind. They will each serve a three-year term. Returning directors include: Kristin M. Anderson, RPR, San Antonio, Texas; Max Curry, Jr., RPR, CRI, Franklin, Tenn.; Linda K. McSwain, RPR, Mobile, Ala.; Michael E. Miller, FAPR, RDR, CRR, Houston, Texas; Christine Phipps, RPR, North Palm Beach, Fla.; Jennifer Sati, RMR, CRR, CRC, CRI, Dayton, Minn.; and Nativa P. Wood, FAPR, RDR, CMRS, Mechanicsburg, Pa., Immediate Past President. LAS VEGAS, Aug. 23, 2017— The National Court Reporters Association (NCRA), the country’s leading organization representing stenographic court reporters, broadcast captioners, CART captioners, and legal videographers, today announced that Doreen Sutton, RPR, a freelance court reporter from Scottsdale, Ariz., has been awarded Fellowship in the Academy of Professional Reporters. The Academy recognizes recipients for their outstanding and extraordinary qualifications and experience. The announcement was made during a special awards luncheon held at the NCRA Convention & Expo, held in Las Vegas, Nev., Aug. 10-13. “Membership in the Academy of Professional Reporters is by nomination only, so to be granted fellowship is a high point in a reporter’s career,” said Dave Wenhold, CAE, PLC, interim Executive Director and CEO of NCRA. “Criteria for being accepted include exhibiting outstanding and extraordinary qualifications and experience in the field of shorthand reporting as well as having been active in the practice of reporting for at least 10 years. Candidates for fellowship are also required to have attained distinction as measured by such activities as the publication of important papers, creative contributions, committee or board service, and teaching,” he added. Sutton has been a reporter since 1992, working as a freelance reporter, official reporter, and a CART captioner. She currently serves as NCRA’s 2017-2018 Vice President. She also served two terms as NCRA’s Secretary-Treasurer and on its Test Advisory, Outreach, and Finance Committees. Sutton is a past director and past president of the Arizona Court Reporters Association and has served as editor of its membership publication, ArizoNotes. She has volunteered her time by holding Saturday Registered Professional Reporter prep classes at her office. Since 2007, she has also served on the GateWay Community College Advisory Board, which guides the school’s court reporting program. She holds the nationally recognized professional certification of Registered Professional Reporter. Sutton was one of seven NCRA members awarded Fellowship in the 2017 Academy. Career information about the court reporting profession—one of the leading career options that does not require a traditional four-year degree—can be found at DiscoverSteno.com. (Phoenix, Arizona) July 17, 2017: Coash & Coash, Inc. is proud to announce that Jordan Jackson of the Gateway Community College court reporting program has been awarded the first annual $1,000 Coash & Coash, Inc. Court Reporting Scholarship. Student candidates were nominated by the faculty of the Gateway Community College court reporting program. The criteria for selection were machine steno speed level, length in the program, attendance, and monetary need. The candidates wrote letters and were interviewed by Coash & Coash, Inc.’s Chairman, Gerard T. Coash, RPR, RMR, CRR, and President, Jerry Coash, Jr. 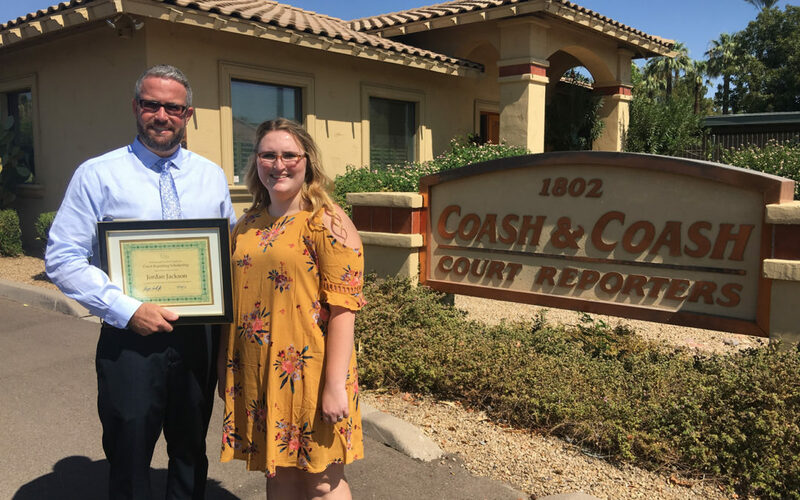 The Coash & Coash, Inc. Court Reporting Scholarship will be awarded annually to a student in Gateway Community College’s court reporting program. GateWay Community College’s Court Reporting Program will be hosting an Open House/Information Night on Wednesday, July 12, from 5:30 to 7:00 PM. Students and graduates will be doing demonstrations and giving tours. Refreshments will be served. Please join us, and we hope you will help us to get the word out. Location: 108 N. 40th Street, Phoenix. Court reporting is a career where you can choose the type of work you’d like to do, whether it be in the freelance world taking depositions and such, or working in a courtroom taking trials and court-related matters, or CART or captioning. We really do have choices, and it’s wonderful to see the opportunities available for licensed court reporters. I’d been working as a freelance court reporter for 20-some-odd years. I chose that field of court reporting in part for flexibility in schedule. I have three children, and I wanted to be able to earn a decent living but do it around my family’s schedule. Working as a freelance court reporter allowed me to attend school functions, dance recitals, football games, or stay home with my little girl when she had the flu. That was my choice, and I loved it! Of course, there was a downside to freelance reporting. First and foremost, for myself anyway, there is never a guarantee of regular payment. Very often I was waiting months to be paid on a job, and it could be very frustrating waiting for your expected commissions of $15,000 while receiving a deposit of $1,200. Also being a 1099 contracted reporter, there are no health benefits offered or paid vacations or holidays or paid sick time. But for me it was worth the tradeoff to be there as a mother for my children when they were growing up and still contribute to the household finances. And then my youngest reached the age of 19 years old. Where had the time gone? He really didn’t need me at home any longer. My daughters were out of college and on their own. I was walking around the house thinking what do I do now? I had thought about working in the courthouse for a year or so, but I was very nervous about making that change. My schedule had never been consistent. As a freelance reporter, I could be assigned a job at 10:00 a.m. that was supposed to go all day but actually finished at noon. I could be driving to Globe or Tucson or even Yuma for jobs. I worked for different agencies to try to fill up my time, as many reporters do working overflow. And all of my work was in the field of civil litigation. How could I possibly make the change to working in a courtroom, taking trials in criminal matters? I said to myself: Why not? Just apply. See what happens. I was hired by Maricopa County Superior Court within a month. After 20 years of reporting, I had enough experience as a reporter. But little did I know what lay ahead. I remember my first week saying to myself “What have I done?” I couldn’t possibly fathom a life of 8:00 to 5:00 Monday through Friday. And then learning the language of the courthouse was not easy. What on earth do they mean by IPTC, FTMC, PTMC, CPTC, PCR? What is morning calendar? settlement conferences? evidentiary hearings? changes of plea? sentencings? all kinds of motions? It can be a little overwhelming. When are all these transcripts due? And I hadn’t even gotten to a trial yet! But I calmed myself down and took a deep breath. I was working in Superior Court now. I told myself, “Deal with it.” I asked questions. I kept track of things. I backed up everything. I learned. I learned that it’s not much different actually than freelance. We all take our jobs. I’m in the court reporter pool. Therefore, I am assigned to different courtrooms at different times. It’s just like freelance going to depositions, except I don’t have to drive to the location. I just walk to whatever courtroom I’m assigned to. When someone requests a transcript, we prioritize and schedule and produce that transcript. We invoice our own work, and we keep track of our payments. The best thing about that is I don’t have to split a commission! Being a State employee working for the County of Maricopa, I have a regular paycheck, paid holidays, sick time and other perks. I took my first paid vacation in over 20 years last year! It was great! I’ve met some wonderful people --experienced court reporters with great stories, bailiffs, clerks, judicial assistants, judges, commissioners, and attorneys. There have been so many helpful people that I’ve learned from. And although I know there are some who feel that court reporters might be irrelevant, I’ve met several judges and court staff as well as attorneys who see the value in having a court reporter in the courtroom to take the proceedings. When you’re in the court reporter pool, you’ll get your next day’s assignment in an email that will tell you what courtroom or courtrooms you’ll be covering that day. Changes of plea – I had a defendant collapse in the courtroom during one of these proceedings. Phoenix Fire Department was called. All of these have to do with things that go on before a trial begins. Seriously, I had no idea! Also in morning calendar you may do sentencings. Sentencings are also scheduled for Fridays when there are no trials. Sometimes these can take a bit longer when people are coming into court to speak on behalf of the defendant. I took a sentencing that lasted over two hours with 14 people speaking on the record on behalf of the defendant before we got to the actual sentencing part of the proceeding. After morning calendar you may be in trial in that courtroom or be sent to another courtroom to cover a trial. If it’s the beginning of the trial, you’ll have to be ready for jury selection. Or you could be covering a trial that’s been ongoing or even covering a verdict in a case you haven’t covered at all. On Fridays there are no jury trials going on, but you may be sent to cover a settlement conference. A settlement conference is a proceeding in which the attorneys, the defendant, and the judge sit down and discuss settlement of the case before trial. I’ve covered as many as eight settlement conferences in one afternoon. None of the work a reporter takes during the day is typically due until an appeal has been filed. At that time the reporter will get a notice and eventually a due date. This is where organization is the key. I began working in court last May. It took a few months before I had any transcripts ordered. Now that I’ve been in court for a year, transcript orders are coming in regularly although I’m not nearly inundated as some reporters. I know some reporters who have hundreds and hundreds of pages being requested regularly. Throughout that time I’ve also had some expedite requests and I’ve taken grand jury proceedings, which are always produced immediately. Then you get into electronically filing the transcripts and invoicing clients. That’s a whole new area of learning. Court reporters in Superior Court typically write 200 pages a day on average. That’s an incredible amount of time on your machine. It’s fast-paced and can be very interesting as well as exhausting. I’m sure I haven’t covered everything a court reporter in Superior Court must do. As I said, I’ve learned a great deal, and I’ve met some wonderful people. Being a licensed court reporter has given me the opportunity to work the way I wanted to early in my career, working around my family’s schedule. And now it’s given me the opportunity to learn new things and meet new people. I can honestly say moving into the courtroom has sparked my interest in my work again. Who knows what the future holds for me or for the court reporting profession? But if you’re contemplating a change, take the leap! Have faith in your ability. I always say, if I didn’t have to work, I wouldn’t. There are plenty of other things I would love to spend my time doing. But because I have to work, I am blessed that I can say I really like my job! Attitude is everything.